We've had a beautiful four day weekend... time to breathe at a rather hectic time of year. It was Show Day here on Thursday, so of course we went to the show. Even though we said last year that we wouldn't. The show was loud and packed and smelly and we all left with worn out feet and ears. We did have a great time on the dodgems and patted a few animals and Audrey had a ponyride... and all the free apples we could eat! 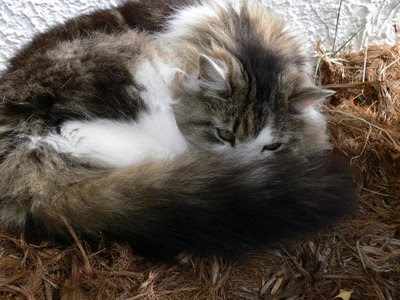 We also discovered that our 9yo puss may in fact be a Norwegian Forest Cat, rather than just a plain old stray from Wantirna... Some of us have fallen in love with her all over again, but I remain unmoved... As does she.